` You don't get anything for nothing. Sadly. But you can get something without having to fork over cold hard cash. Swapping is perhaps about the oldest form of commerce. You have something I want, and I have something you want, so we swap. Outside of the playground though, it can be hard to form a good network of people to do a bit of swapping with. Until the internet arrived. With the World Wide Web it is possible to find lots of people, all around the globe, who have something to swap. The sites I've looked for here are the less obvious ones. We all know about things like nanny sharing, car sharing, and home exchanges. You'll find a note of websites in these areas at the bottom of the article. But the focus in this post is on the swaps you might not have thought of! Last year I looked at the ways you can barter. One of these was an exchange of skills. Cleaning, ironing, gardening, accounting, bookkeeping, beekeeping. You'll find the post HERE. One website I mentioned was Time Banking UK. It includes a number of videos showing time banks in action and various time bank events. 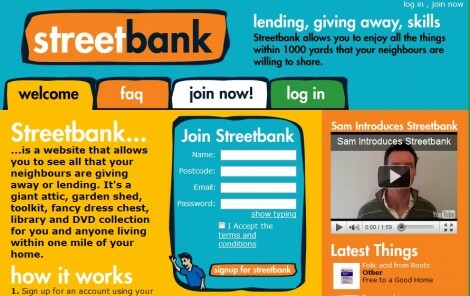 StreetBank also puts you in contact with your neighbours. You sign up with your postcode, and can then see everyone within a mile radius of you, and what they're offering. It's more than just sharing skills, it's also for exchanging, lending and giving away things. A little like Freecycle in some ways, on an even more local level. This is a clearly a big favourite. Book swaps have sprung up everyone. My local train station has one set up in the Waiting Room, and I use it. All you have to do is replace a book for a book - either put back the one you've borrowed or put a new one in there. Many people I know have one in their workplaces too. They're all based on an honour system, but it seems to work well. There's online versions too. I love the artwork on Book Mooch. You put up books you don't want. And mail them when requested, for which you get points. 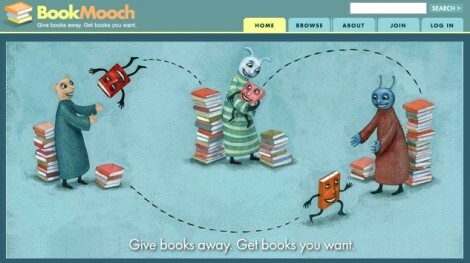 You can then use these points to get books from others. Read It, Swap It has a running total of the books available on the site. When I looked this was 362,162. What I like about all these swapping schemes, whether it is a shelf in your office or via a website, is that you don't have to find someone who likes your book AND has a book you like. Plus there's no need to return the book afterwards, so that does away with the guilt. Or maybe it is just me with a tendency to borrow books from friends and then forget who I borrowed them from? This is increasingly becoming a popular past time around where I live. A few of the mums have had 'swap shops'. You take along your clothes, and swap with someone else. It's been a great way for me to boost my wardrobe. The thing is, I have stored all my clothes from my teens and early 20s. All the best items anyway, as I figured that all that 80s stuff would come back into fashion one day. Plus I went through a stage of buying vintage designer gear. However, while I am losing weight and getting myself fitter, the truth is. I am never going to be a size 8 or 10 again. I don't even think I want to be, not when I remember how hungry I was for most of my late teens. Because I just don't have that sort of natural shape. My natural shape is maybe a 12. But probably a 14 as I'm too lazy to exercise as much as I should (and life is too short to do stuff that bores the pants off me!). If you don't have any local events happening among your friends, you can host one yourself. Or pop online. 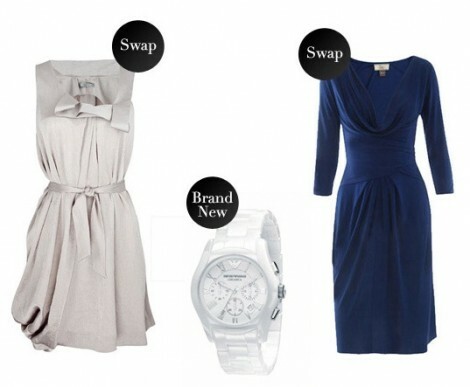 Swop2Shop and BigWardrobeallow you to sell your clothes rather as you would on an online site like eBay (you can upload pictures too), for points that you can spend on other items on the site. If you've any space at all, even a windowsill, save some cash by growing your own vegetables, herbs, and flowers. Plus, they look nice. I wrote about saving money with your garden recently, you can read the post HERE. The Garden Swap Shop helps people to swap seeds, and also plants and gardening equipment. If you live in the South East or fancy a bit of a trip to the seaside, then you might want to take a look at Seedy Sunday. This is, according to the website, the UK's biggest community seed swap. It is held in February of every year, in the Brighton and Hove area. Carsharing is always a good way to save money. Take a look at National CarShare, and RideShare. To help save on childcare, there's NannyShare and The Nanny Sharers. And finally, the ultimate money saver. Swapping your home for a holiday. Check out Home Link and InterVac. Thank you! Was hoping that someone would come along with lots of other sites too. Half of what I'm wearing right now I got swapping clothes. And I'm about to go to the park with a book that I got from the book swap at the station. And when I get back I'll be planting with the pots I got in a swap with a neighbour (for my nettles! now that's a bargain AND I got a container of the yummiest soup as well). thanks! yes I'm already a great fan of freecycle and freegle. I have two sets of Ikea bookshelves thanks to them, and a set of drawers in my bedroom!